HireaSTEMVet is a Veteran employment program, providing Career guidance and support services to Veterans and Military spouses, to help kick start their rewarding careers in STEM occupations. We assist returning Veterans in making a successful transition from the military to civilian professional world. Founded by industry experts, both Veterans and civilians, we have a 180 degree road-map for successful transition. With a passion to STEM (Science, Technology, Engineering and Math), HireaSTEMVet is dedicated to leveraging technology to develop tools and methodologies to help veterans and Military spouses successfully transition into STEM jobs across the country. We believe that Veterans are an elite group that already have a certain level of intelligence that got them into the military. Studies have shown that” Only three out of 10 young people can even qualify for the military today”. Those that make it in develop skills that any Company would appreciate. 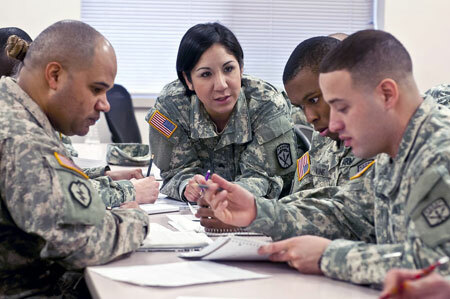 In the military, many soldiers gain vast experience using sophisticated and cutting-edge technological innovations that require skills in the science, technology, engineering and mathematical (STEM) fields. The armed services personal are trained to lead and innovate as well. In addition to the approximately 200,000 service members who transition from active duty every year, there are hundreds of thousands of Veterans, Reservists, Retirees, Guardsmen and their respective spouses who are looking for new employment opportunities. We can match these service members with ever growing need for trained and qualified people in STEM related occupations, where it has been predicted by the U.S. Department of Labor that there will be an estimated 1.2 million new jobs in STEM-related fields each year, by the year 2020.